Playing devil’s advocate in conversations about race is dangerous and counterproductive. White people playing devil’s advocate in conversations about race are completely counterproductive to actual progress. 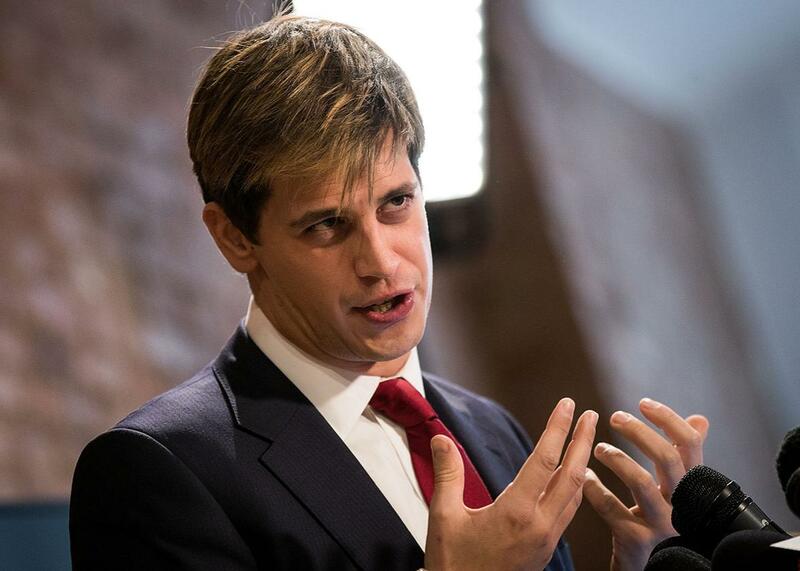 Milo Yiannopoulos speaks during a press conference in New York City. I’ve been asked to consider the devil’s point of view so often over the course of my life that I’m beginning to feel like I know him. When having conversations about race with a white person, there are no five words I have come to dread more than, “Just to play devil’s advocate … ”—they’ve unseated “not to sound racist, but … ”—a feat I heretofore thought was impossible. A few years ago, following a panel presentation I had made at a conference, I was approached by an audience member. The man had waited in line for 10 minutes so he could tell me that his son had been denied admission to my law school alma mater because, unlike me, he was white and so couldn’t benefit from affirmative action. I recounted this infuriating story to a white friend of mine recently after it was reported that the Trump administration would begin targeting universities that use affirmative action policies for possible legal action. Instead of rolling his eyes along with me, my friend forced me to debate him—on behalf of the man from the panel and (as he reminded me when I started to get upset) the devil—on whether maybe I really hadn’t deserved admission to my law school. He wondered whether I felt guilty over the chance that I took a position away from someone who “earned” it over me and whether I could ever really be sure that race had nothing to do with my admission. If not, didn’t that cheapen the credential for me? After all, he argued, while he himself had graduated from a lower-ranked law school than I had, no one could ever claim he didn’t deserve admission. Shouldn’t we get rid of affirmative action, then, for the sake of people like me? After I pointed out that my school had not been legally permitted to use race as a factor in admission since 1996, he shrugged his shoulders, raised his hands in defense, and reminded me that he wasn’t really disagreeing with me. The devil made him do it. As heightened racial tensions around an emboldened white supremacist movement increasingly shape our political discourse, cross-racial conversations about race have become both more necessary and more common, and thankfully so. Unfortunately, this has invited a dangerous tendency for white people to engage in these discussions with people of color by summoning the devil himself and treating racism as a political disagreement around which two opposing viewpoints can reasonably form. In doing so, they are insisting that people of color engage in an intellectual exercise in order to justify our own existence and safety—an ask that is at once disingenuous on the part of white people and emotionally strenuous for those of us forced to entertain it. White people are an absolutely crucial component in the discussion and actions that must take place in order for concrete progress to occur, particularly in the current political climate. But in order for their participation to be valuable, they must be willing to confront white supremacy head-on rather than by way of harmful mental gymnastics. There is no way to productively ask a person to participate in an argument that questions their equality as an epistemological experiment. This would be a galling exchange in any debate, but it is made especially painful in conversations surrounding race between white people and people of color. When I’m asked to engage in a debate about whether a white supremacist can still be a kind person or whether I earned my spot in law school, I am being asked to consider an opinion that questions not my worldview, but my worth. That’s why Stephens’ strategy falls apart here—I can’t grant “moral respect” or have empathy for a line of reasoning that, when its conclusion is reached, denies respect or empathy to me. Armed with the cloak of dispassion, the devil’s advocate is free to proceed with much less tact and care than they otherwise would have to, and that transforms a conversation about race into a simulated verbal attack that can feel no different to a person of color than an actual verbal attack would. It requires that people of color first make a full-throated defense of their humanity and then grant an immediate and complete absolution to the person who just demanded such a thing. And if the psychic conflict that results from this is distressing for an adult, that kind of emotional and mental labor being demanded from a child can be harrowing: Last month, a white teacher assigned to her fifth-grade class in Irmo, South Carolina, a homework assignment prompting students to imagine themselves as members of the Ku Klux Klan. “Why do you think your treatment of African-Americans is justified?” it asked. The school is predominantly white, but at least one black student in the class was distraught by the question and came home crying, according to his uncle, Tremaine Cooper, who posted about it on Facebook. Appropriately, the school district stated that it would make sure the prompt is “never used again” in their classrooms and that the teacher was being placed under administrative leave while an investigation is conducted. The boy is reportedly feeling better for having spoken up. Yet I have to wonder if, for better and for worse, this incident will remain an imprint on his psyche in the years to come, all because his teacher felt the desire to play footsies with that sinister spirit. And while the recourse for her actions is a step in the right direction, so often in our day-to-day lives, white people get to act as both participant and spectator of a devastating courtroom drama where only they walk away free at the end. As a concept, the devil’s advocate is incoherent. If a position is really as unpopular as the name indicates, there is no need to argue for it. Debating isn’t an ideology; it’s a methodology. We debate to get to a truth, not for its own sake. Most often, the devil’s advocate is really saying there is something at the core of the argument that they are (perhaps ashamedly) compelled by, and so they employ a rhetorical trick allowing themselves to argue a position without ever having to hold it. This allows exploration of deep-seated racism under the guise of putting forth someone else’s argument. The irony is that it could invite a deeper discussion of race than may otherwise happen, since it inherently reveals what white people really think and struggle with around race. But because of the charade, no one is able to benefit from it—the person being vulnerable is essentially able to call “take back” and act as though the conversation never really happened. It creates an unfortunate paradox where some of the most reflective demonstrations of racial politics are being had under the condition they be immediately un-had. This reveals the central problem with the devil’s advocate: In order for it to be effective, it is their sparring partner who must actually thread the needle. It’s the other person who must be willing to treat the discussion seriously on the promise that the person arguing with them will not. And in matters of race, asking a person of color to refrain from feeling any pain while you disparage them on someone else’s behalf is not an intellectual exercise; it’s an act of cruelty. I am not sure that there is any issue that lends itself to this tightrope, but race surely doesn’t. It is too important, too dangerous, too precious, too raw. Race is the last issue where the devil would ever need an advocate. I suspect that what people like my friend are really saying when they utter those five magic words are five different words: “Can you help me understand?” They are more vulnerable and require more of an admission than most people are comfortable making to begin a debate, but these conversations don’t have to be debates. We only debate with the devil. If people would stop defending him, these conversations could become a lot more productive.